Design Issues. There are two considerations that most small format photographers are ill-equiped to deal with because they typically don't occur in small camera operation--camera "movements" and how these influence lens and body design. Before discussing specific large format designs, it is important to have at least a limited understanding of several issues that arise from movements of different parts of the camera. Movements. With just a few exceptions, all 35mm, medium format and digital cameras have fixed film and lens planes--the only movement possible is focusing--moving the lens closer to or farther from the film. While you can get major benefits from large format photography simply by shooting with cameras that use larger film, most large format designs also provide added flexibility to change the lens planes relative to the subject plane and some also allow changing of the film planes relative to the subject plane. These movements allow the large format photographer to compensate for kinds of perspective distortion and to manipulate more effectively the field of "acceptable" sharpness of focus. Perspective Control. Perspective distortion is frequently inherent in the positions from which our cameras view objects--objects with parallel sides instead appear with converging lines. You might want to use this distortion to convey a sense of depth or height, but in many cases it is seen as the photograph rendering objects in an unnatural way. Movable lens standards and movable film backs allow you to record objects in the way that seems more natural to human perception. In this series of movements, both standards remain parallel with each other, but can be moved up (rise), down (fall) or to either side (shift). These movements help prevent changes the shape of the objects through having to unnaturally tilt the camera. They increase or decrease the convergence of naturally occurring parallel lines. In the figure to the right, the green rectangle represents the film gate on the rear standard; the white rectangle with the doughnut is the front lens standard. Front view of a camera with a front lens standard that supports rise/fall and shift. Keeping Things in Focus. A second kind of movement allows one or both standards to move as if they were mounted in a gimbal. This changes their relation to each other from one of being parallel to one of being at oblique angles. This affects how the phenomenon of depth of field is applied in using focus to further our creative intentions. With the film back and lens in their normal positions, the zone of sharp focus is between two lines that are parallel with the film back, but in many cases the objects that we want in sharp focus are not all equidistant from the film back. For example, they might arrange themselves on a plane that was on a diagonal to the film plane. 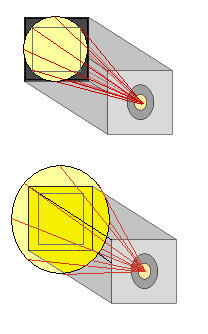 With the lens and film back in standard position the zone of sharp focus exists between the two yellow lines. What we really want, in this case, is to create a zone of sharp focus between the two diagonal red lines. If we swing the either the lens or the back on its vertical axis, we can change the plane of focus to the red area and keep all three objects and the background in focus. The same kind of adjustment can be made for objects at different distances from the film plane as they arrange themselves "above" and "below" each other in the frame ; this uses the tilt adjustment on the lens and/or film standard. As most of the camera designs discussed in this site support at least some movements to control perspective and plane of focus, you may want to consider the degree to which different large format designs and specific makes and models support different kinds of lens and film plane movements. Here is a page with more information about camera movements. Orientation. Except for the 6x6 format, most cameras use rectangular formats--one dimension is longer than the other. We exploit this difference by shooting landscapes in landscape (horizontal) orientation and tall buildings in portrait (vertical) orientation. With cameras with fixed film planes and lens mountings, we simply turn the entire camera--lens and film plane--90° to change the orientation. When the camera design supports movable front and rear standards--where we are changing the shape of the camera by adjusting it--changing the orientation of the frame relative to the subject gets more complicated. Many large format view cameras have either a rotating back--the film gate rotates 360° in the film plane--or a reversible back--the back can be removed, turned 90°, then reattached to the camera body . Many older press cameras can do neither, which limits their usefulness to control perspective and plane of focus. Lens coverage. Shopping for large format lenses is a little different than shopping for lenses for your Canon EOS. First, with most large format lenses there is generally no automation. Some lenses boast automatic shutter cocking. but many are cocked manually with a separate cocking lever on the shutter. With the use of perspective control, another optical performance parameter takes on importance--coverage. Different lens designs, even of the same focal length, can project larger or smaller circles of illumination on the focal plane. A camera designer must use a lens whose circle of coverage is as large or larger than the diagonal of the format. Because there are design and manufacturing tradeoffs in providing larger coverage, lenses for cameras without perspective control often have coverage that is just adequate--the top diagram below. This works fine as long as the lens stays put, but when you begin shifting the front and rear standards, the circle of illumination begins to move on the back standard. Unless the circle of coverage is larger than the film frame--middle diagram--shifting the circle will cut off part of the image as seen by the film. This is a particular problem with short lenses, so a significant part of the design cost for large format wide view lenses is in maximizing the size of their coverage. Further, there are usually tradeoffs for the photographer; increasing coverage usually means increasing size and weight of the lens. When shopping for a large format lens, know the diagonal of your image frame ( 4 x 5 is 162mm) and buy lenses that have at least that coverage circle. The more you expect to use movements, the larger the image circle must be. The bottom illustration helps you visualize how this would be approached when considering the effects of rise and fall of the image within the circle of illumination. Most manufacturers of large format lenses publish coverage circles in their specs. Michael Gudzinowicz has saved the rest of us a lot of work by compiling lens specs for many large format lenses. This is published on graflex.org . I have published data from the Kodak Data books about Ektar lenses .